This stir fry gives those restaurants a run for their money. 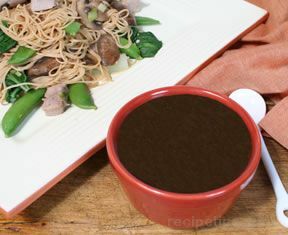 The sauce thickens up perfectly and the beef and vegetables are coated with it. Slice beef into very thin strips. In a small bowl, mix cornstarch, broth, soy sauce and garlic. 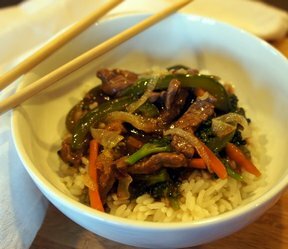 Stir-fry beef in nonstick skillet until browned and juices evaporate. Add onions, peppers and broccoli, if desired. Then add cornstarch mixture. Cook, stirring constantly until mixture boils and thickens. 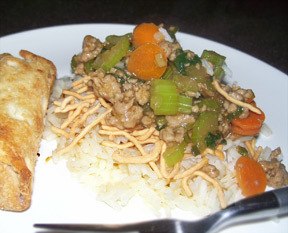 "I added a teaspoon of fresh minced ginger to the sauce. I thought this was a really good stir fry. I had to cook the onions on the side since I had a non-onion lover - and I think they were actually better than if they had been cooked with everything else. They got all caramelly and brown and worked perfectly with everything else."